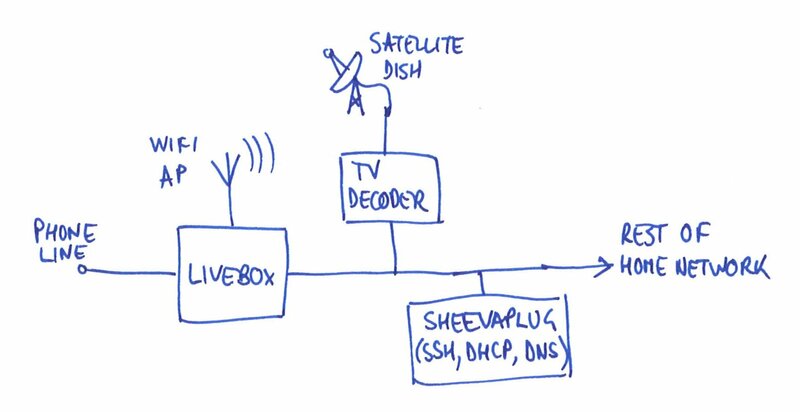 For several years, I’ve been running a small server (a Sheevaplug, as it happens) connected to my home broadband connection. It’s not running anything public, but it’s simply handy to have somewhere I can log in to and do things with from anywhere on the internet. It used to be connected via Virgin Media’s cable broadband service, using an Apple Time Capsule as a router, and a dynamic DNS service to handle the name lookup, and it all worked just fine. I could access my server from computers both inside and outside the house. Recently I moved house, and the new place has broadband provided by Telekomunikacja Polska masquerading as Orange. Their broadband deal comes with its own router which also provides the VoIP phone service as well as having something to do with the TV. It’s a Livebox 2.0. It would probably be possible to set up a different router to do the same job, but the thought of getting the VoIP stuff to work is too awful to contemplate. The Livebox 2.0 is a fairly flexible box, and I managed to set it up to forward traffic on one port to my server. The server has a little script which updates its dynamic DNS entry, and that did exactly what it said on the tin. I could log in to the server from elsewhere on the internet. But could I connect to the server’s public IP address from inside the house? No way. The router just reported ‘no route to host’. This was annoying. I have various things set up on my laptop which assume they’ll be able to connect to my server, and to have those not work when I’m at home would be a real pain. The problem seemed to be that the Livebox didn’t want to route traffic from the internal network, where my laptop was, to its external IP address. Reading Wikipedia on NAT, it turns out that this is a feature called NAT loopback. I didn’t even know it was possible for routers not to support it, but I learn something every day. The Orange Livebox 2.0 won’t do it (and yes, I played exhaustively with all the security/firewalling/port forwarding options). This called for a workaround. My server has a DNS entry with a dynamic DNS provider. Let’s call it server.dyn.com (it’s not, actually). This resolves to whatever the external IP address of my router happens to be – let’s say 203.0.113.1. From inside my home network, the router makes a mess of handling traffic to 203.0.113.1 so I can’t contact it. However, I have control of DNS on the home network: it’s one of the services on my Sheevaplug. I know that ‘spoofing’ DNS entries is bad practice, but I’m going to do it anyway. I can add entries to my local DNS server which make server.dyn.com look up to 192.168.1.10, the local address of the server. The laptop won’t know the difference, but it’ll be able to contact the server. And outside the home network, there’s no chance of anyone, including me, accidentally contacting my DNS server because there’s no way for traffic to get to it. Here’s a picture. It worked! At home, example.dyn.com resolves to 192.168.1.10, and out on the internet, it resolves to 203.0.113.1. I think it’s far from perfect – the timing settings on my dyn.com record probably need to be made shorter, so that the laptop doesn’t hang on to them when I leave home, and this setup means that all other subdomains of dyn.com don’t work, but it’s good enough for me for now. Maybe it’ll be helpful for you too. This entry was posted in Projects and tagged electronics, linux, livebox, orange on December 10, 2013 by martinjonestechnology.